1842 map, showing Montmorency County as Cheonoquet, the county's name from 1840 to 1843. Montmorency County is a county located in the U.S. state of Michigan. As of the 2010 United States Census, the population was 9,765. The county seat is Atlanta. A detail from A New Map of Michigan with its Canals, Roads & Distances (1842) by Henry Schenck Tanner, showing Montmorency County as Cheonoquet, the county's name from 1840 to 1843. Several nearby counties are also shown with names that would later be changed. 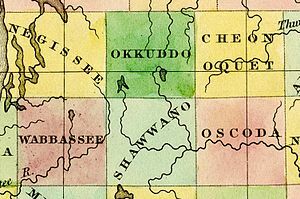 The county was created by the Michigan Legislature in 1840 as Cheonoquet County, after a well-known Chippewa (also known as Ojibwa) Chief, whose name meant Big Cloud. Cheonoquet took part in Indian treaties in 1807, 1815, 1825 and 1837. Renamed Montmorency County on March 8, 1843, it was originally spelled Montmorenci, and historians conjecture this reflects the area's French-Canadian influence: the French Duke of Montmorency purchased a lieutenant governorship in Canada and the first archbishop of Canada--Montmorency-Laval--both could be influences on the county's name. (There was no "Count Morenci" aiding the American Revolution). The county was organized in 1881. The reason for the change in spelling is subject to some dispute. See List of Michigan county name etymologies. The name Montmorency probably means Mountain Moor. Montmorency is a boggy land or moor that is at the top of a broad mount or highland. When the county was organized in 1881, some land area was taken from Cheboygan and Alpena counties. Three townships were divided: Briley, Montmorency and Rust. By 1901 Albert, Hillman Township and Wheatfield were added. Brush Creek, now known as Hillman, was the first county seat. In 1891 the county seat was moved to Atlanta. According to the US Census Bureau, the county has a total area of 563 square miles (1,460 km2), of which 547 square miles (1,420 km2) is land and 16 square miles (41 km2) (2.8%) is water. Although it lies on Michigan's Lower Peninsula, Montmorency County is considered to be part of Northern Michigan. Most of the county is covered by state forest land. There is an abundance of lakes, such as Long Lake. Glaciers shaped the area, creating a unique regional ecosystem. A large portion of the area is the Grayling outwash plain, a broad outwash plain including sandy ice-disintegration ridges, jack pine barrens, some white pine-red pine forest, and northern hardwood forest. Large lakes were created by glacial action. There are no traffic lights in Montmorency county, although a few blinking lights exist at highway junctions. As of the 2000 United States Census, there were 10,315 people, 4,455 households, and 3,047 families residing in the county. The population density was 19 people per square mile (7/km²). There were 9,238 housing units at an average density of 17 per square mile (7/km²). The ethnic makeup of the county was 98.36% White, 0.24% Black or African American, 0.36% Native American, 0.10% Asian, 0.10% from other races, and 0.84% from two or more ethnic groups. 0.65% of the population were Hispanic or Latino of any ethnic group. 28.3% were of German, 12.7% English, 9.5% American, 8.8% Irish, 7.6% Polish and 7.4% French ancestry according to Census 2000. 98.1% spoke English as their first language. There were 4,455 households out of which 22.50% had children under the age of 18 living with them, 58.10% were married couples living together, 7.10% had a female householder with no husband present, and 31.60% were non-families. 27.50% of all households were made up of individuals and 15.40% had someone living alone who was 65 years of age or older. The average household size was 2.29 and the average family size was 2.75. The county population contained 20.30% under the age of 18, 5.90% from 18 to 24, 20.90% from 25 to 44, 29.10% from 45 to 64, and 23.90% who were 65 years of age or older. The median age was 47 years. For every 100 females there were 96.60 males. For every 100 females age 18 and over, there were 94.90 males. The county's median household income was $30,005, and the median income for a family was $34,784. Males had a median income of $30,910 versus $19,299 for females. The per capita income for the county was $16,493. About 9.80% of families and 12.80% of the population were below the poverty line, including 20.00% of those under age 18 and 8.70% of those age 65 or over. Dairy products and dry beans are an important part of the county's agricultural production. Service industry and retail trade relating to tourism make up most of the economic base in this rural area. Boating, fishing, and other outdoor activities are offered in abundance. Voters in Montmorency County favored Democratic Party nominees at the start, but since 1896 have usually voted for the Republican Party. Republican Party nominees have garnered the Montmorency County vote 76% of the time (26 of 34 elections). The county government operates the jail, maintains rural roads, operates the major local courts, records deeds, mortgages, and vital records, administers public health regulations, and participates with the state in the provision of social services. The county board of commissioners controls the budget and has limited authority to make laws or ordinances. In Michigan, most local government functions – police and fire, building and zoning, tax assessment, street maintenance etc. – are the responsibility of individual cities and townships. Atlanta is the "Elk Capital of Michigan". Every year during opening day of Elk hunting season the largest bagged are displayed at the "buck pole" on the town's central square. During the off season, driving around in the wilderness surrounding Atlanta looking for these graceful creatures becomes a pastime of locals, cottagers, and tourists. Rainbow trout, brook trout, steelhead, perch, bass and other pan fish abound. The county is a hotbed of fly fishing and angling on the edge of some world-class streams and rivers. White tail deer hunting is a popular local activity and the firearms deer season opening (November 15) being noted as a holiday to some residents, with schools being closed on opening day. Most of the land in Montmorency County is controlled by state or federal government, making the county a popular hunting area. Snow shoeing, cross-country skiing and snow mobile riding are popular outdoor activities. The Sno*Drift rallying race is held on snowy surfaces in January. Morel mushroom hunting is a local pastime and attracts many tourists. There are many recurring events throughout the area, such as the annual sled dog races held near the end of January on Clear Lake State Park. ORV/ATV and snowmobile trails are some of the state's best. Many areas are designated as "trail mazes" on some maps. Montmorency County is one of the few counties that allow ATVs on public county roads, thus creating access for fuel, food and various hotels to Hillman, Atlanta, and Lewiston. The main trail system incorporates a scenic Elk tour and various levels of ATV trails. The newspaper of record for Montmorency County is the Montmorency County Tribune. Montmorency County is home to Michigan's most endangered species and one of the most endangered species in the world: the Hungerford's crawling water beetle. The species lives in only five locations in the world, two of which are in Montmorency County, both inside the Mackinaw State Forest. The first site is along the East Branch of the Black River where two adult beetles were found in surveys in 1989 and two more again in 1996. In July 1999, six additional adult beetles were identified in the county living in Van Hetton Creek. This latter find was significant as it represented a new location beyond those originally identified when the Hungerford's crawling water beetle was categorized as endangered on March 7, 1994, under the provisions of the US Endangered Species Act. The Van Hetton Creek sighting therefore provides the possibility that more of these very rare beetles might be found elsewhere in Montmorency County. ^ a b c d Newberry Library. "Michigan: Individual County Chronologies". Atlas of County Historical Boundaries. Retrieved November 4, 2016. ^ a b "Bibliography on Montmorency County". Clarke Historical Library, Central Michigan University. Retrieved January 20, 2013. ^ a b "State & County QuickFacts". US Census Bureau. Archived from the original on July 15, 2011. Retrieved August 28, 2013. ^ "A History of Northern Michigan and Its People". google.com. ^ a b Montmorency County home page. ^ "2010 Census Gazetteer Files". US Census Bureau. August 22, 2012. Archived from the original on November 13, 2013. Retrieved September 27, 2014. ^ "NPWRC :: Regional Landscape". usgs.gov. Archived from the original on June 25, 2013. ^ "US Decennial Census". US Census Bureau. Retrieved September 27, 2014. ^ "Population of Counties by Decennial Census: 1900 to 1990". US Census Bureau. Retrieved September 27, 2014. ^ "Census 2000 PHC-T-4. Ranking Tables for Counties: 1990 and 2000" (PDF). US Census Bureau. Retrieved September 27, 2014. ^ "Montmorency County tourism profile" (PDF). Michigan State University extension service. ^ "About us". AtlantaMichiganChamber.com. Retrieved April 11, 2018. ^ "Pigeon River Country Elk Range". Michigan Department of Natural Resources. ^ "J-L School Calendar". jlas.org. Johannesburg-Lewiston Area Schools. Retrieved April 11, 2018. ^ "Economic profiler, Montmorency County". michigan.org. July 15, 2007. Archived from the original on July 15, 2007. ^ "List and calendar of events". NEMichigan.com. Archived from the original on January 28, 2001. ^ "Calendar of events". hillmanchamber.org. Hillman MI: Hillman Area Chamber of Commerce. 2018. Retrieved April 11, 2018. ^ "MUSH Clear Lake State Park Sled Dog Race". sleddogcentral.com. Archived from the original on January 3, 2010. Retrieved April 11, 2018. ^ "Montmorency Township". Michigan County Atlas (2nd ed.). Kappa Publications. Sections 3 & 4: 127. ISBN 978-0-7625-6505-4. ^ "Off Road Vehicle Road Map" (PDF). Montmorency County Tribune. 2009. Retrieved April 11, 2018 – via montmorencytribune.com. ^ "The Montmorency County Tribune - News, Sports, Weather and Entertainment". Wikimedia Commons has media related to Montmorency County, Michigan. "Bibliography on Montmorency County". Clarke Historical Library, Central Michigan University. The Enchanted Forest, Northern Michigan source for information, calendars etc.